Xaviera Simmons, Convene, 2018, installation view at Hunter’s Point South Park, Long Island City, New York. Courtesy the artist and David Castillo Gallery, Miami. In Convene, Xaviera Simmons’ new site specific commission for SculptureCenter the artist set out to investigate how assumptions about the demographic makeup of Astoria and Long Island City came to exist. 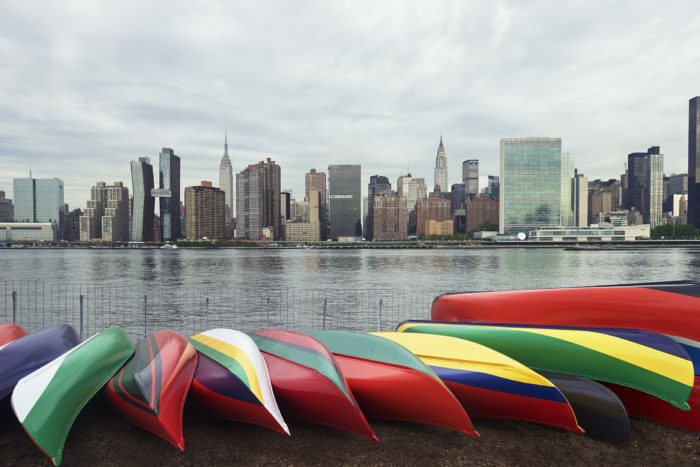 Her research led her to create a sculptural installation of aluminum canoes that now flank the East River in Hunter’s Point South Park in Long Island City. 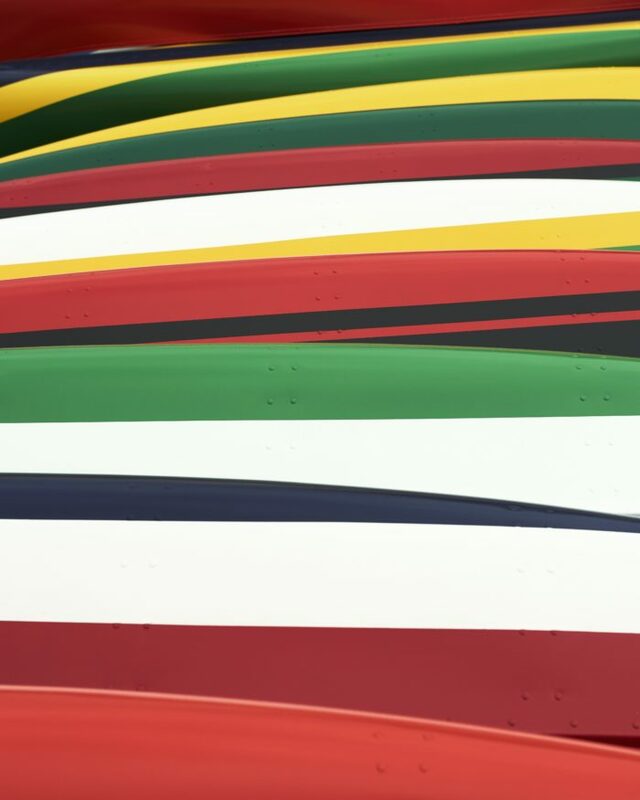 Each canoe is painted with striking, colorful designs representative of national flags corresponding to the diverse historical and contemporary populations from the area. “I wanted people to have a way in. I wanted them to recognize themselves a bit inside of this space,” Simmons says of the project. Like Simmons’ past work, Convene grounds itself in an anthropological mindset. To create the work, Simmons looked at population data, as well as the language and available information supplementing it, abstracting what she learned to create the canoes. Her motives for creating Convene can read as an exploration into the history of New York’s immigration patterns. “You can’t associate a flag without thinking of the politics of the space,” Simmons explains. In this vain, Simmons made sure to represent the Japanese, South Korean, Guyanese, Italian, and Pan African communities, among others, that call Long Island City and Astoria home. Simmons is straightforward in her storytelling. The artist purposely made Convene even more explicit than past projects. “I made sure to include most of the countries that Trump tried to enact a travel ban against that also have sizable populations here. I tried to un-censor because you don’t see these flags,” Simmons says. The chosen form of the canoe has dual meaning. In addition to the piece residing along a major waterway that once served as an entryway for early settlers into the area as a means of transportation, canoes were also used as a method for escape. Convene addresses the multiple meanings a canoe may have, whether being used out of leisure or fear.